After them being on sale over in the US since last autumn, the Surface Keyboard and Mouse are now available to purchase in the UK (and also Germany). These are the peripherals which were launched alongside the Surface Studio in late October last year – although note that the Dali-esque Surface Ergonomic Keyboard (designed to combat typing-related RSI) still isn’t available over here yet. 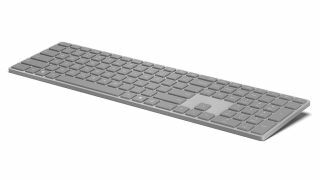 But you can buy the standard Surface Keyboard plus the mouse over at Microsoft’s UK online store, priced at £90 and £45 respectively. Both wireless peripherals use Bluetooth 4.0 and match in terms of color scheme and design (with the gray colour also matching up with Microsoft’s Surface Book convertible). The mouse buttons are designed to have a satisfying click action while remaining nice and quiet, and you get a premium build incorporating a metal scroll wheel. The device is powered by a pair of AAA batteries which should last for up to a year according to Microsoft. As for the keyboard, again that’s designed for a stable and quiet typing experience, and it’s the same deal with the batteries as the mouse (two AAA batteries which will last for up to a year). The Surface Studio itself is yet to emerge in the UK, but hopefully will do soon (and fingers crossed for the ergonomic keyboard, as well). Although it’s worth noting that there are some decent offers on both the Surface Book and Surface Pro 4 over at Microsoft’s online store right now, with 15% off some models.